The Worm in The Hall | American McCarver. Your Sports Blog. Dennis Rodman is being enshrined in the Basketball Hall of Fame today. 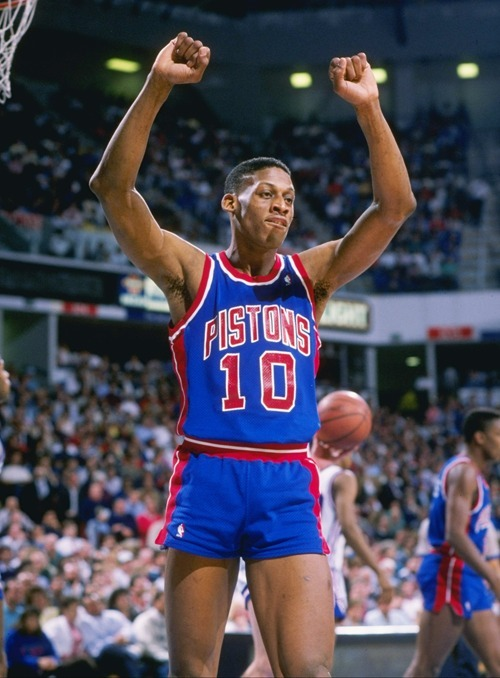 I loved watching Rodman play. He quietly antagonized every opponent, got in their heads, made them take the first swing, and then manage to look at the referee with genuine shock, SHOCK!, when he was called for a foul. And he backed it up with an uncanny ability to “fetch the ball,” as Phil Jackson called it, winning seven rebounding titles in his career. Also, he fucked Madonna, back when it mattered. Sadly, he’s mostly remembered now for his antics off the court. A legacy which he’s brought upon himself. The off the court stuff bugged me, but not for the reasons you’d think. The on-court antics were sublime. He was one of a kind. A fucked up Eddie Haskell-like god of mischief and rebounding. Off the court? Whatever. I’ve known weirder. Check out the video below. The way he wraps himself around Malone, the dirtiest player in the NBA, while making it look like he’s just trying to get himself up is masterful. This was somebody who enjoyed going to work.